SeaStreak was brought up from New Jersey to help with passenger traffic. With two ferries sidelined with mechanical problems, the Steamship Authority will continue to operate through the weekend with service from freight boats and the passenger-only SeaStreak ferry. The freight ferry Gay Head has been pulled into service Sunday for those leaving the Vineyard, the Steamship Authority said Saturday in a press release. The freight ferry is scheduled to depart from the Vineyard at 6:30 a.m. and 8:30 a.m. Sunday. Standby service will only be allowed for medical emergencies Sunday, the boat line said, including for passengers whose reservations were cancelled. 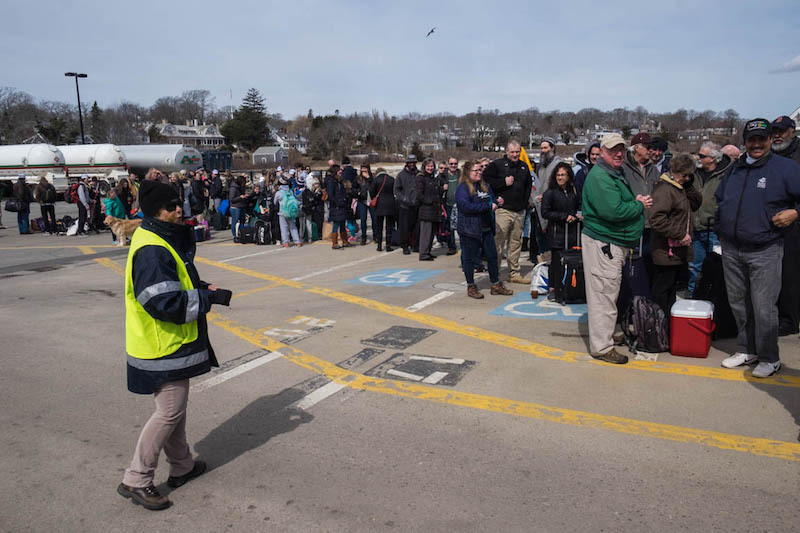 Customers with vehicle reservations on the 7 a.m. and 9:30 a.m. trips of the Woods Hole Sunday will have their trips transferred to the two earlier Gay Head trips, the Steamship Authority said. The reservations office will reach out to customers to inform them of reservation changes. The ferries Martha's Vineyard and Woods Hole are both out of service. The Martha’s Vineyard is not expected to be back in service until late Monday at the earliest, the Steamship Authority said in a press release. The ferry Woods Hole is also expected to be out of service until at least late Sunday. 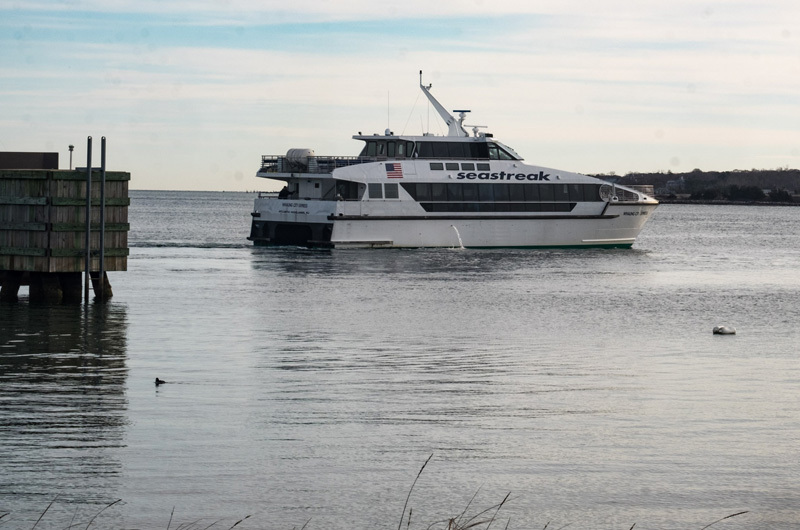 The SeaStreak ferry, which normally provides summer passenger service between New York and the Vineyard, is providing service for walk-on passengers Saturday and Sunday, "operating essentially as a passenger shuttle service on an hourly basis to provide as many trips as possible," the Steamship Authority said. The Steamship Authority encouraged customers traveling this weekend to call the reservation office at 508-477-8600. The office is open until 7 p.m. Saturday. The Katama has continued making regularly scheduled runs including an additional run late night run Friday from Woods Hole. 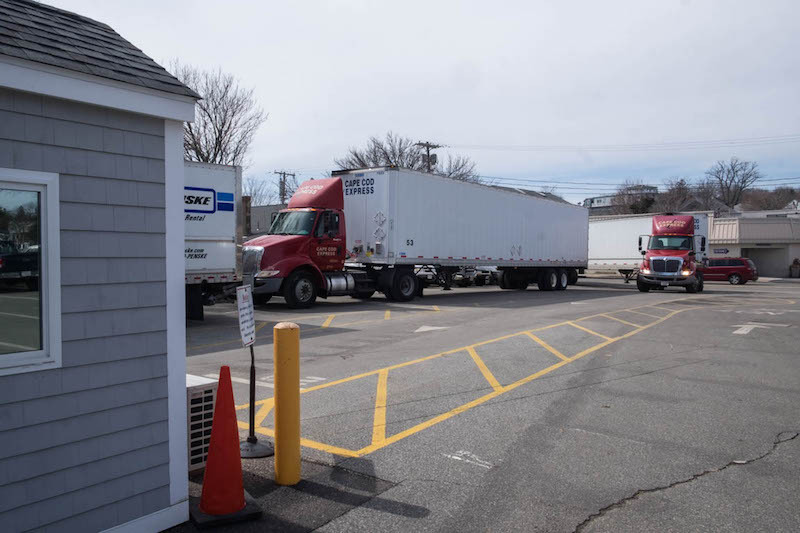 The trips were added to accommodate “trucks with food and other goods whose reservations were cancelled,” the Steamship Authority said. The Katama also made an early run Saturday, departing at 4:30 a.m., and then began its regularly scheduled trips, starting at 5:30 a.m. in Vineyard Haven. The Sankaty will continue to take over for the ferry Martha’s Vineyard. All trips for the ferry Woods Hole have been canceled for the weekend, and at this time there are no standby options except for medical issues. The problems began last Saturday evening when the ferry Martha’s Vineyard ran out of power off East Chop during its 8:30 p.m. run. It had to be towed back to Vineyard Haven, arriving around 1 a.m. The Martha’s Vineyard was briefly put back into service on Monday but by Wednesday it was pulled out of service again. The loss of the Woods Hole on Thursday evening left the boatline with just the two freight boats to carry vehicles. The SeaStreak made the trip up from New Jersey to help out with the passenger load. In a press release on Friday, Robert Davis, Steamship Authority general manager, said an indicator light went off on the console of the Woods Hole as the vessel was loading for the 5 p.m. trip on Thursday from Vineyard Haven to Woods Hole. Passengers and vehicles were transferred to the freight ferry Katama. Both the Woods Hole and the Martha’s Vineyard are now at the Steamship’s maintenance terminal in Fairhaven. The Island Home has also been out of service but is expected to return sometime next week. The result has been a chaotic scene all week long at the Vineyard Haven and Woods Hole terminals. On Friday morning the vehicle line in Vineyard Haven stretched back to Five Corners as passengers and crew tried to figure out what to do. “I’m thinking of swimming over,” said Krista Barnett, who had arrived at the terminal at 8:45 a.m. for her 9:30 a.m. ferry reservation. At that time the website listed all the ferries as running on time. Suzanne Reppert, also in line Friday morning, tried to put a positive spin on the situation. “No icebergs yet,” she said. On Friday evening Graham Lawson, Kevin Boya and Mike Turocy of Lagasse Custom Builders were on their way home after a long day of work. They had been scheduled for a 5 p.m. boat, which had been canceled and now were looking to the 7:30 p.m. boat. To pass the time they shared some chocolate cake outside their work van. “I’m starting to get a little nervous,” Mr. Lawson said. His predicament spoke directly to the long journey of the week; his parents had been traveling on the ferry Martha’s Vineyard when it lost power the previous Saturday. They were headed over that evening to have dinner with their son but never made it after having to be towed back to Vineyard Haven. Enid Haller and her daughter Bean were also in line late Friday evening. They had been scheduled for the 7:15 p.m. boat but were now looking at the 8:30 p.m. boat. For them, more communication would have helped. “It’s weird, we can’t get a straight answer from the SSA,” Enid said. “They should at least send us an email or something,” echoed Bean. Aw, c'mon, it is so Charming to spend hours or days with plans in limbo and life on hold! I sure do miss the Islander! She served us VERY well for 57 years. Other than her near sinking on Wednesday, March 19, 1980. I remember it well because it was the first time I ever got to see my father Jeff on TV. He was wearing his bright orange jacket and worked with the Oak Bluffs Fire Department. They sure don't make them like they used to! It's nice to not have to rely on a boat to go and explore places anymore. I miss the island so much and will always call it home, but it's nice to not be STUCK anywhere anymore. If they build a bridge, you will want to leave! Whatever your idea of "an island lifestyle" is, it will be history! Remember the "Sack The Mac" committee? Such island patriotism should not be forgotten. Praises to the Steamship Authority working teams who must be exhausted. Tough situation. Stay safe & sometimes warm, everyone. just think of all the money that could have been saved if they used sea streak like boats to move the people and sankity type boats to move the cars. trips would be 1/2 hour as well. shuttle the every half hour. Where is the Governor?i loved that boat! In 65 years of traveling back and forth on the reliable SSA ferries I guess I’m amazed that nothing quite like this hasn’t happened before ! I’m thankful it isn’t the last week of July....and that the SSA is doing the best they can. So the woodshole spinning in the harbor created a 35 foot deep void and scattered sand to the sides so it was grounded. I hope they fix that. Time for the steamship to get a competitor. Why is this Monopoly allowed? The sea breeze boat is awesome!! Please include this type of service for passenger travel: quick no frills and comfortable! In addition to the regular slow boats include high speed passenger only boats. You can change a bit more and make some money!